What are prepositions in English grammar? The word “preposition” comes from the Latin word praeponere (put before.) Prepositions show the relationship between a noun or a pronoun and other words in the sentence. When you learn English, you will immediately recognize what is meant by prepositions because they are some of the most common words in the language. 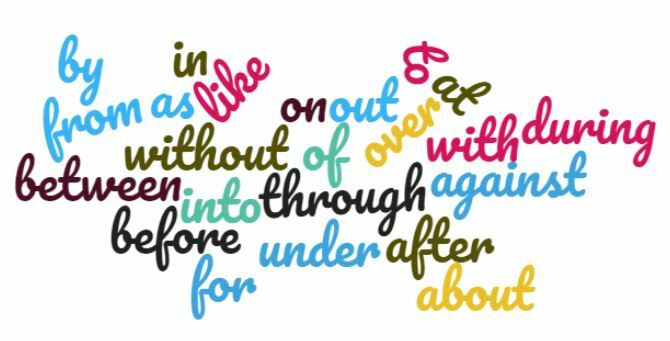 And of these – on, in, at, by, under, above, to, out, from, and with are the most common preposition words. Prepositions are used more frequently than other individual words. For example, the prepositions of, to and in are among the ten most frequent words in English. In all, there are about 150 prepositions in the English language. How are prepositions used in English Grammar? to introduce an object. These are called dependent prepositions. We hiked over the mountain. Please don’t talk during the show. We left at 4 p.m.
Don’t go before you have called your mother. I’ll meet you after work. The way to recognize a preposition in English grammar is that it will appear as part of a prepositional phrase. A prepositional phrase will begin with a preposition and end with a noun, pronoun, gerund, or clause, the “object” of the preposition. The object of the preposition will often have one or more modifiers to describe it. A prepositional phrase contains no verbs.